Kitchen Countertops Quartz Countertops Is Engineered Quartz Countertop a Better Choice for My Kitchen? Quartz kitchen countertops avoid some of the problems that are encountered in the case of other materials used for kitchen worktops. For instance, even if it is one of the favorite choices among homeowners, granite comes with several drawbacks including the fact that its surface is porous thus requiring regular sealing in order to avoid stains. With an engineered quartz kitchen countertop, you will not have to deal with such a problem as this worktop is made of a mixture of epoxy resin and natural quartz thus offering a solid and resistant work surface that doesn’t need any sealing. 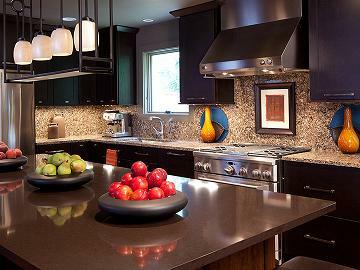 Also, engineered quartz countertops are low maintenance and scorched and scratch resistant. For people who have health issues, such an engineered quartz countertop is the perfect choice as its surface is manufactured to avoid any bacterial contact. Since the quartz surface is non-porous, bacteria will not be able to settle in and begin to grow inside. Also, engineered quartz countertops are made from top materials that make their surface more forgiving when it comes to working with it. For instance, such countertops are less likely to break mainly because they are heavier and denser when compared to other materials including natural quarts. Engineered quartz countertops can be found in large variety of colors. These colors cannot be found in nature mainly because the crushed quartz minerals are usually combined with top dye in order to get the engineered countertop. So, when planning to have a new countertop for your kitchen space, you should definitely take full advantage of the versatility provided by an engineered quartz countertop. Engineered quartz countertops come in colors that can really dazzle the eye even if they still have the natural appearance of a stone material. For instance, the edge profiles encountered in the case of the engineered quartz countertops can range from some really simple bevels to ogee just as it is the case with the countertops made from other natural stones. However, you should know that the installation of such a countertop is not to be considered as a DIY project. On the contrary, you will have to hire a professional in order to have this job done in an effective way. Also, you should be aware that engineered quartz countertops aren’t the cheapest choices around – actually, their costs rival natural stone countertops. For instance, the average cost for having such a countertop installed is approximately $50 per square foot installed or even higher.